Overall comment: Good meal at a cozy diner! And it's a "featured diner" too! This was my last dinner at San Francisco during my last trip to the US. My cousin & I decided to pop-by Mel's as we couldn't find a parking spot anywhere else. Mel's Drive-In seems to look decent & they have ample parking space in the busy city of San Francisco. We had no idea what's good at San Francisco & we were kinda hungry & tired. All we wanted was a good meal after a long day of driving & walking around. Since Mel's looks decent, we just decided to pop-by, not knowing whether it's a good place to dine or not. To our surprise, Mel's is actually a VERY popular diner! That's how much we know San Francisco....hahaha. The place was packed, even when we arrived there around 9+pm local time! Guess who was here before...? It's Guy Fieri, host of "Diners, Drive-Ins & Dives"! American fries topped with chili & served with onions & grated cheese "Mel's family recipe". Since we weren't VERY hungry (we were more tired than hungry), we decided to order the turkey for sharing. It felt like Christmas. I was expecting roast turkey in a "brown" look, but it came out "white"! Something really different from my imaginations. The stuffing was quite interesting as well since it's actually bread! I love the cranberry sauce that came with the turkey. Simple, yet delicious dish :) The turkey was tender & juicy...true comfort food after a long day. This is certainly one place to try out for a true-American dining experience :) Prices are reasonable (dollar to dollar) & the place is certainly cozy & comfortable for a good meal. Overall comment: Really generous portion for the price paid! Looks delicious, tastes yummy & very pocket-friendly! After having tried every other American food, my cousin brought me to his favourite Vietnamese restaurant in town. It's a simple restaurant with no fancy name nor interior design, but it sure serves good, comfy food for the hungry! "No forks in the house..chopsticks only" :P Truly Asian! From the 1st look, I'm reminded of a foodcourt back in Malaysia/Singapore. Nothing fancy at all & most of the customers are Vietnamese. Prices are pretty reasonable & if you're not that hungry, even the small will be quite a lot to finish up. Shrimp, pork, lettuce, cilantro & vermicelli noodles freshly rolled in clear rice paper. This was very filling! It doesn't feel like an appetizer/side order when you order a bowl of Pho as well! The peanut sauce that came with it was very fragrant. I loved it! Only in 1 size i.e. medium, this bowl of noodles was HUGE! It comes with a combo of rare slices of steak, well-done brisket, flank & tripe. Oolala...SO delicious! It's not that easy to get a fresh whole coconut in Fresno/California. Unlike Malaysia, most coconut drinks here aren't served whole...ah, this is such an Asian thing, right? Overall comment: Intense flavour with real durian pulp/flesh as well! The only down-side that got me slightly disappointed was the "melting-rate" - it melts really fast compared to other ice-cream potong! 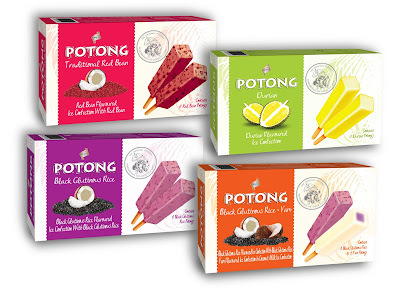 King's Potong aims to bring all its supporters a trip down memory lane with its improved version of the ice-cream potong. The one that I would be reviewing below is the King's Durian-Flavoured Ice-Cream Potong, which has a new packaging design & a more intense durian taste with real durian puree. According to King's, it's almost like eating a frozen durian fruit itself! Doesn't this "scene" remind you of the good old days? I love the intense durian flavour & the bits of real durian in this sneaky, simple-looking ice-cream potong. It looks plain, but when I started licking it up & biting on it, oooooh, it does feel like eating frozen durian, but it's more creamy & not as "fibre-ish". I would still prefer the actual frozen durian fruit, but this is actually quite a good treat, especially when it's not durian season. My only put-off is the "melting rate". Apart from that, I think this is a pretty good ice-cream potong! The King's Potong comes in 2 packaging forms i.e. the multipacks (contains 6 ice-cream potong per box) & the foam packs (contains 9 ice-cream potong per box). There are 4 variants in multipacks (RM5.40/pack of 6 sticks): the classic Red Bean, Black Glutinous Rice, Durian & also Assorted Flavours (Red Bean + Yam + Black Glutinous Rice). The foam packs are only available for the Red Bean & Assorted Flavours (RM8.50/box of 8 sticks) - the ice-cream in foam packs are supposed to last for 2 hours without freezing! Fuh! Work hard, play hard, chomp even harder! One of the latest burger joints in town is Big Chomp Burger! It is opened as a joint venture by 3 friends who loves burgers, where 1 is the main business brainer (Adrian), 1 is the chef (Josiah), while the other is a Korean investor friend (I didn't manage to find out his name).With the many burger joints mushrooming in Klang Valley, I'm sure you'll be wondering, what's so special with this burger joint that's different from the rest? As the latest addition to the competitive burger race, Big Chomp aims to satisfy their customers with simple, delectable burgers without the usual lettuce, tomatoes, & cucumbers! It's like good news to meat-lovers, eh? They're more into coleslaw as their "veggie" & fried-egg/omelette is found in almost every burger available here! Really cute tag-line: Work Hard, Play Hard, Chomp Even Harder! Their little mascot(s) are REALLY cute! You won't find yourself in a stuffy, smoky burger joint as the restaurant is built with sufficient space for good air-circulation. They offer a decent variety of burgers, but it's bound to expand & change ;) So pop-by whenever you can & check out their Facebook page for new burgers/promotions! Burgers at Big Chomp comes in 2 burger bun variety (recipes come from Big Chomp's chef, Josiah.) i.e. charcoal bun & white sesame seed bun, all home-baked by a friend as their restaurant doesn't have enough space for them to have ovens to bake the buns in-house. I personally prefer the charcoal bun as I find it softer & the texture's more "fluffy" compared to the white sesame seed bun. This was the another burger that I managed to try 1/4 of it. I didn't find a "wow" factor as the deep-fried chicken batter kinda put me off a little. Batter was slightly too thick in comparison with the chicken meat, and there wasn't an impact with the grilled pineapple to the burger. We've shared our opinion with the owners & they will be looking into getting the batter improved. Yay! Most of us were excited upon seeing this burger. It looks yummy, but those who managed to sink their teeth into this burger felt that there was too much carbs/"flour" happening, especially with the hashbrown & thick-batter deep-fried chicken. It's spicy, all right....cheesy too! Something I would like to try the next time I go there. Similar to the Chomp C+, which is a chicken variant. But I'm quite sure this one would taste better since it comes with bacon instead of ham! Some experiments & improvements need to be done on the grilled Portobello as it needs to have its moisture sealed & locked in some nice batter. According to those who ate the veggie burger, there's a lacking of "umph" in the burger. It's not just the absence of the meat, but the juiciness & flavour of the mushroom. 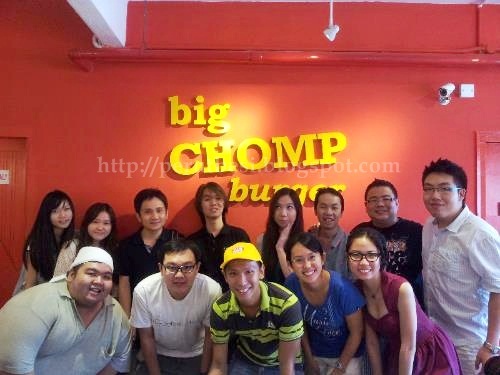 Foodirector foodies at Big Chop Burger!